Leg pain and numbness can cause constant discomfort and difficulty sleeping. If your leg pain or numbness lasts for more than a few hours, you should consult a physician to determine a plan of action. Your symptoms could indicate nerve damage, cardiovascular issues, a vitamin deficiency, or even an undetected insect bite. More than 20 million adults in the United States suffer from one of 100 different types of peripheral neuropathy, which causes a tingling pain or numbness in your legs, hands, or feet. This nerve disorder starts in the feet and causes a burning sensation in the legs. Peripheral neuropathy is commonly a result of diabetes, alcohol and tobacco use, or chemotherapy. Sciatica is another condition commonly associated with leg pain and numbness. The sciatic nerve runs from the lower back down the leg to the foot. If the nerve is damaged or pinched, you can experience burning leg pain or lack of feeling. Treatment for leg pain and numbness depends on the cause. Schedule an appointment with a physician to determine the source of your symptoms and the best treatment plan. Diabetics experiencing leg pain may need to be treated for neuropathy prevention. Those that have suffered from spinal injuries or arthritis may require surgery to treat their numbness and pain. We also offer extended hours and weekend availability. 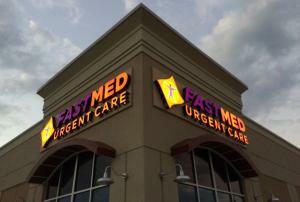 Contact us today or walk into a FastMed Urgent Care to determine the cause of your leg pain and numbness and get the treatment and relief you need.